I just finished my freshman year at Mary Wash and overall, I am really happy. I met some truly amazing people who have become my best friends. Some things I liked about the school was its size-the small size of the student body and the campus itself allowed for me to constantly see people I knew while walking around campus or eating at one of the two dining areas. However, at the same time, as much as I loved this small school feeling-it was also frustrating at times because when I did want some space it became hard to find when I was always running into people you know. For this reason, I would often head downtown on the weekends to get away and do my work-Hyperion, a coffee shop downtown was perfect for this. As far as academics go, my classes were not that challenging for general education classes and I found most of them quite interesting and the professors to be friendly and organized. I expect my classes next year to be much harder but I look forward to it. The social scene at MW leaves something to be desired. The parties are not bad but are often a bit overcrowded and typically consist of the same people—you don't meet many new people unless you really venture out and go places you have never been before because only a small percentage of the school really goes out it seems…but for this reason you are able to know the names of most of the people you party with and get to know them on a more intimate level-something that you might not be able to do at a bigger "party school," and as a result you create more of friends rather than drinking buddies. Overall, i really enjoyed my freshman year at school and am excited for next year. 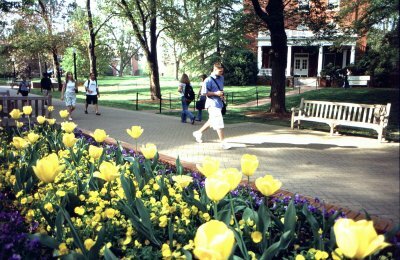 Come to Mary Wash if you want a relaxed atmosphere in all aspects of college-academics and social life included.